We offer top class windows of all types. We also do their assembly. We treat each client individually according to his needs. If you are interested in purchasing and installing modern, energy efficient windows, please contact us. We will prepare an offer tailored specifically to your needs. Our prices are very competitive. You can afford to pay less for heating energy! Six enclosed air chambers inside the window profiles guarantee very high thermal insulation, something which was impossible to achieve until now without using additional, costly solutions. In replacing the old windows with new energy-saving Corona SI 82 windows, the current energy consumption can be reduced by at least 29%. In a standard single-family house, this allows a saving of approx. 1226 litres of heating fuel and a decrease of harmful CO2 emission by approx. 4 tonnes annually .Because of theirthree independent sealing planes the energy-saving Corona SI 82 windows provide excellent protection from noise and adverse weather conditions. Very high thermal insulation guarantees comfort. Even during the most severe winter, the temperature on the inside surface of the profiles does not noticeably drop below room temperature. Thanks to modern technology, the Corona SI 82 windows eliminate the problem of draughts and condensation on the window surface. The very economic Schüco Corona SI 82 windows can be easily tailored to individual requirements and preferences because of the wide range of profiles, glass panes and system accessories. 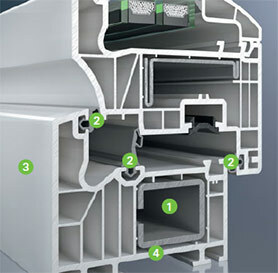 High durability of the material used to produce the energy-saving Corona SI 82 windows is not the only advantage of this system. Ideal thermo-insulation properties do not detract from the appearance of the windows . The frame profiles are elegant and narrow, allowing substantially more light to penetrate through the windows. The considerable savings in energy obtained with Corona SI 82 windows make it possible to design spacious, illuminated interiors, which are very trendy especially in modern architecture. The slightly convex, unique sash geometry emphasizes optical division giving the window frame a subtle appearance. Three various styles and three series of the Corona SI 82 system: Classic, Rondo and Cava as well as a wide range of colours and accessories provide unique freedom in designing interiors and facades. 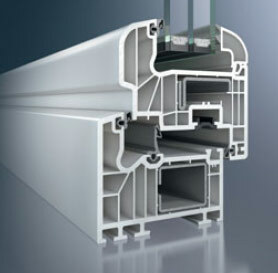 1 Six-chamber profile system with optimal insulation properties. 2 Three sealing planes guarantee optimal protection from the cold, rain and noise. 3 Narrow, visible window profile widths guarantee optimal light access. 4 Above average depth of the installation guarantees safety and effective protection from break-ins. The advanced technological solutions used in the energy-saving Corona SI 82 windows effectively impede break-ins and guarantee the residents comfort and a peaceful night’s sleep . Because of the increased depth of the installation as well as modern steel fittings with mushroom head bolts, penetration of the window barrier is now almost impossible. Toughened components and handles which lock with the use of a key or button make drilling and displacement ofdoor fittings during attempted break-ins ineffective. A standard feature of modern windows is that they are easy to use without having to use force . However, with the correct choice of accessories, everyday use of the windows can be even simpler, safer and more comfortable. 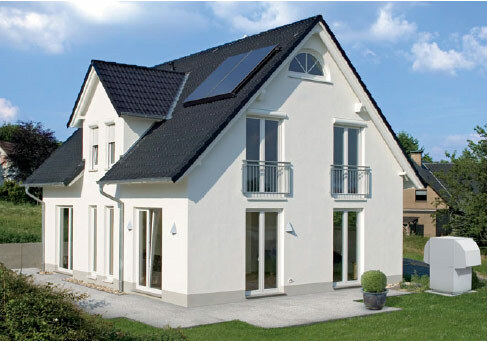 If there is insufficient ventilation in the room, it is possible to install a Schüco Vento system, which guarantees a constant air flow with the windows closed. 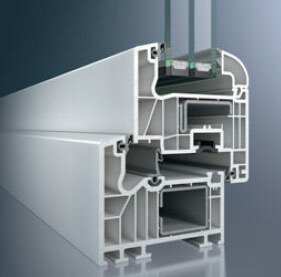 With the Corona SI 82 system it is also possible to produce energy-saving doors with a low, thermo-insulated doorstep. Those of you who notice the difficulties children or persons who are less fit encounter with the doorstep of balcony doors , can replace the traditional frame doorstep with a low doorstep, without the risk of drafts, moisture or heat losses. Windows equally shape the appearance of a building and the atmosphere of residential interiors. The perfect “window onto the world” can be compared to a harmoniously chosen painting frame. The less area the front frame takes up in the overall window surface, the more light penetrates into the interior. The choice of the right window frame cannot be left to chance – the quality of windows affects the comfort of life and the overall value of the real property for many years to come. The economic Schüco Corona SI 82 windows guarantee a wide range of choice according to individual preferences and characteristics of a given building. The offer includes a wide range of colours and methods of opening as well as fittings. A wide range of profiles gives the building’s interiors and facade a unique personality.